Before I left on my trip I FINALLY took the time to do a complete index for the Tip of the Week. I hope this makes it easier to find past posts. If you have any suggestions for improvements or additional topics, let me know. It is nice to be home although the trip was fun. Since I hadn't received my copy of the new issue of Cast On before I left and I wanted to give one to my Dad and sister so they could see the Decoration Day sweater I design in honor of my Mom, I had to find a store in Colorado that carries the magazine. The ladies at Shuttles, Spindles and Skeins in Boulder were nice enough to help me. It is a lovely store. If you are in Boulder, you should definitely visit. I felt bad that I missed Laura Farson who had been teaching there just a few days before. I met Laura at the conference in NH. She has a pattern in Cast On for felted slippers which I am anxious to try. She will be teaching at the conference in Reno. One highlight was a pilgrimage to Doc Holliday's grave in Glenwood Springs, CO. Family history has it that he is a relative (and my mom was a genealogist). I didn't take a photo of the grave but of a tavern instead. 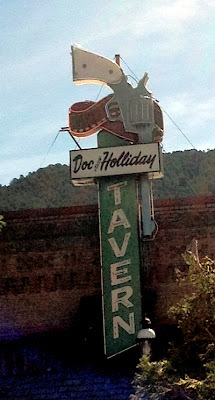 I have always loved this sign. When it is on there are red sparks coming from the end of the gun. The spellings of "Holliday" weren't formalized for quite awhile. You see it spelled a variety of ways in the family records. You wouldn't believe the number of ways to spell it. I answer to pretty much any version. It is easier that way. I came home to quite a few lessons to review but I managed to get them all out the day after I got home. I sent in a proposal for a new correspondence course on gauge. The primary focus of the course will be how to use gauge to adapt patterns and to design but it will have to cover how to calculate gauge as well. I am waiting to hear if it is approved by the TKGA Advisory Committee. Since many of them are at Stitches Midwest I don't expect to hear anything immediately. I would have liked to have gone to Stitches but I just couldn't face getting back in the car again so soon. I approach the topic of this week's tip with trepidation. 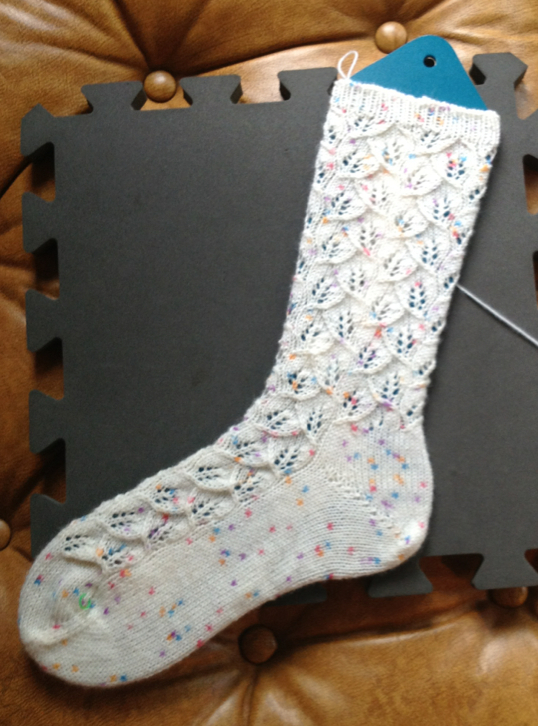 Achieving even tension in stockinette can be very daunting. Even tension means that the stitches are the same size from row to row. There isn't a magic solution since there are so many reasons for uneven tension. Most knitters don't even know they have a problem. I have learned that while most knitters look very carefully at the stitches on their needle, they don't look at the stitches once they are off the needle. You can't fix the problem unless you know there is one. How do you know if you have uneven tension in stockinette? If you look closely at this photograph of the WS of the work, you can see that there are gutters between the rows. 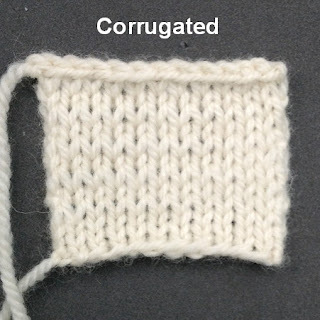 This is particularly noticeable in cable patterns where reverse stockinette separates the cables. Before you can fix the problem you have to diagnosis why you have a problem. Many knitters are not aware that the yarn they are using contributes to the problem. It is very difficult to maintain even tension with inelastic yarns like cotton, linen, and acrylic fibers to name a few. I would avoid using light colored yarns of these types for a stockinette project. Even some 100% wools can be difficult. High twist yarns like Debbie Bliss Baby Cashmerino highlight tension issues. If you are doing swatches for the Basics Class or the Masters Program you will find worsted weight wool like Lion Brand Fisherman Wool, Cascade 220 and many others will give you better results. Once you have eliminated the yarn you are using as the cause, you can explore other reasons. Although the video just addresses continental knitting it can apply to right hand throwers as well. If you have tensioned the yarn around your hand so tightly that it requires constantly resetting the yarn, you may want to experiment with different ways of holding the yarn. The "standard" way to purl is to wrap the yarn OVER the needle but another way you can form the purl stitch is to wrap it UNDER the needle. Try this and you can see that is uses less yarn to form the stitch which makes the resulting stitch smaller. The problem with this method is that it alters the position of the stitch on the next row. 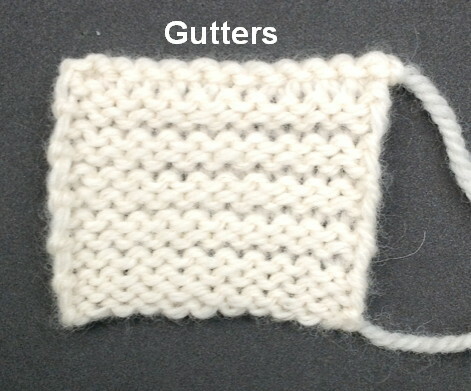 If you knit the stitch through the front the resulting stitch is twisted. You must knit the stitch through the back. This is called Combination Knitting. Many have found it a solution to tension issues. 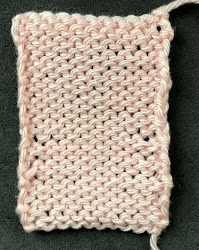 Another thing you can try is to use a smaller needle for purl rows. This requires some trial and error testing. Be careful not to mix up the needles as this will make the tension issues even worse. When you are trying to fix a tension issue, use a systematic approach. Don't just try 20 fixes on one swatch. Cast on 20 or so stitches and try a fix. Bind off and LABEL the swatch. Then try another solution. This way you can clearly see what works or not. Next week's tip will be about tension issues at selvedges. Salon this week will be on Saturday. Quite a few people are out of town. It will be nice to see everyone. It seems like I was gone for ages but it was only a week. I really didn't knit all that much on my trip. The Medusa sweater really requires that I pay attention. 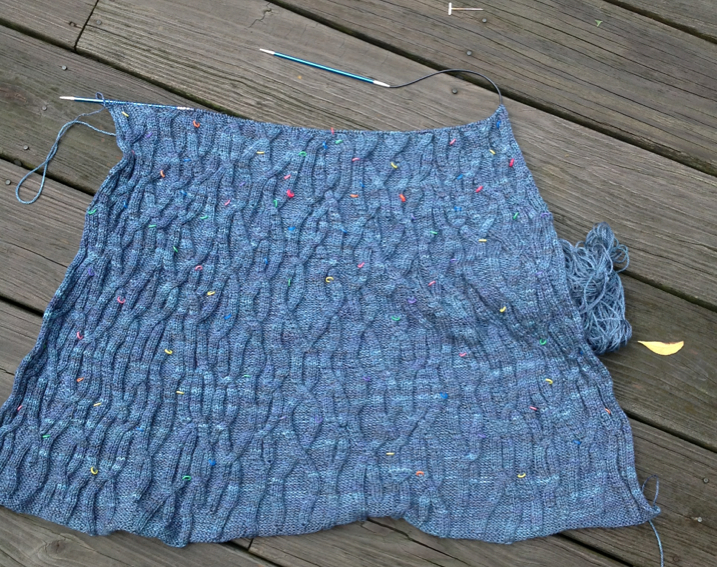 I'm not using a pattern but am making up the cables as I go along and the cables are mirrored on either side of the back. This photograph really doesn't give you much of an idea of what this will look like when it is done. It really requires blocking. I'm still deciding how long it will be. How much yarn I have will determine that. The original I did was a coat but this will be much shorter. I'm hoping to have the back finished this week. I'd love to be able to wear this at the Reno meeting. For airplane knitting I worked on the socks. I managed to finish one. I LOVE this pattern. Lots of ideas to try here! Thanks! 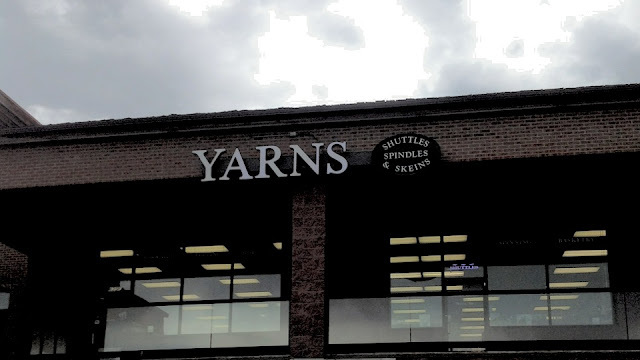 Shuttles, Spindles and Skeins is one of my favorite knitting stores when I'm in the Denver/Boulder area. I'm just an hour and a half southwest of there. cũng bắt đầu triển khai đồ sát Bạch hùng. làm cản chân của đám Bạch hùng phía sau mà thôi . và đại quân slime thừa cơ chạy thoát . khá là tàn nhẫn - Giết không tha . hạ tràng của mấy trăm vạn đại quân slime cũng chỉ có một - Bị đồ sát .